I take a lot of screenshots while I use my Mac. You can see some of them here. Most of my articles include my screenshots. By default, the screenshots you take are saved on your desktop as .png files. You can easily take a screenshot without the need to download/install any third party software. There are a few ways to capture screenshots on your Mac. For instance, you use Command (⌘)-Shift-3 keys to take a screenshot of your whole screen. But if you take lots of screenshots, then you may notice that your desktop is getting crowded. Your desktop clutter may harm your productivity because it would be difficult to find what you are looking for. The first step is to decide where do you want to save them. For this article, I created a folder (screenshots) on my desktop. 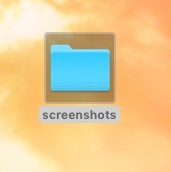 The screenshots I take will automatically be saved in this folder, instead of my desktop. You can do this by selecting Finder > File > New Folder (or just press Shift–Command (⌘)–N). Rename this new folder, anything you want, like screenshots etc. This command will let you apply the changes. That’s it. Now your screenshots will be saved in this folder. Fab! As you say, you can spend valuable minutes searching around for screenshots. I was a screenshots pig, but no more! !